The Garden HUB – Gardening, Lawn & Landscaping HTML Template build for Lawn Services Business, Landscaping Companies, Groundskeepers, Landscape Architects, Gardening Business, Florists, firewood, flowers, ecology, landscape, lawn, lumberjack, Big or Small Gardener Business, Agriculture and companies that offer related services.The design is very elegant and modern, and also very easy to customize with 1170px grid.Gardener template has beautiful and unique design that will be best suited for your online web presence. It has 100% responsive design and tested on all major handheld devices. What ever you are using the device your site will run as it should be. 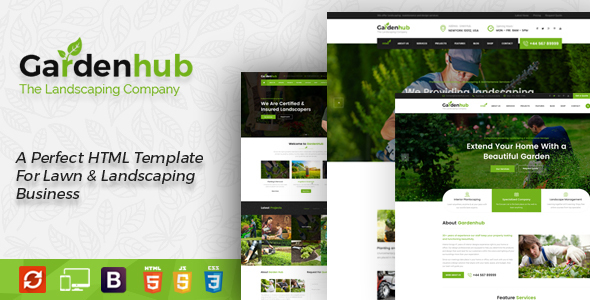 The Garden HUB template is fully responsive layout for all type of devices. The Garden HUB template coded with beautiful and clean codes! Some powerful HTML files 100% valid W3 web standards. 04.11.2017 Version 1.0 - First Release!